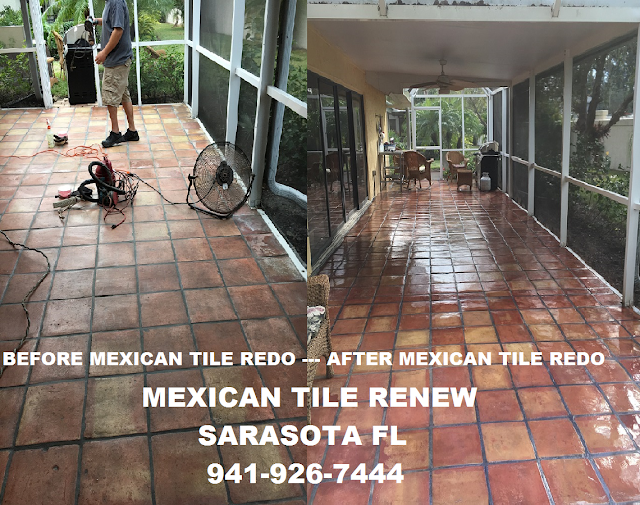 Mexican Tile Renew Sarasota Fl: MEXICAN TILE RENEW OUTDOOR PROJECT OF 35 YEAR OLD TILE IN SOUTH SARASOTA COUNTY FL. 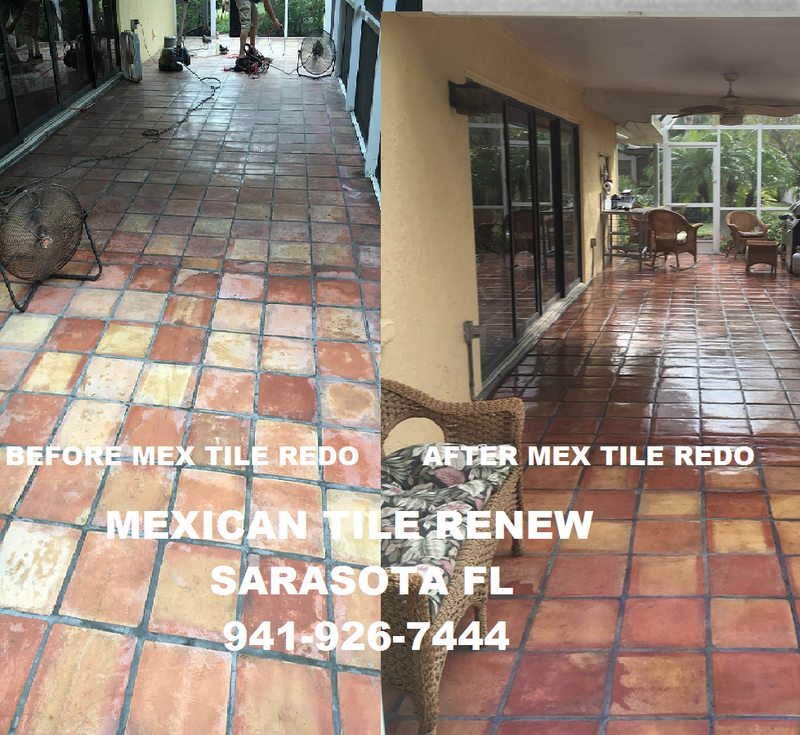 MEXICAN TILE RENEW OUTDOOR PROJECT OF 35 YEAR OLD TILE IN SOUTH SARASOTA COUNTY FL. Note the Efflorescence, the white spots, that formed along the exterior edge of the patio in photo above on left. Naturally, Saltillo tile is not terribly strong or hard. Although it is comparable to other natural stone tiles such as slate or granite it can chip and crack. When used as exterior tiling, it can only be used in very mild climates, as harsh weather can damage the tile, it needs almost annual upkeep. Saltillo tile typically has a MOH measure of hardness rating between a 3 and 4, which is fairly low compare to porcelain, which has an average MOH of 7-9. Therefore, it is very rarely used for outdoor purposes these days, though in very warm climates like the Gulf coast of Florida, well maintained and sealed Saltillo tile makes for a nice tile flooring option for a patio. 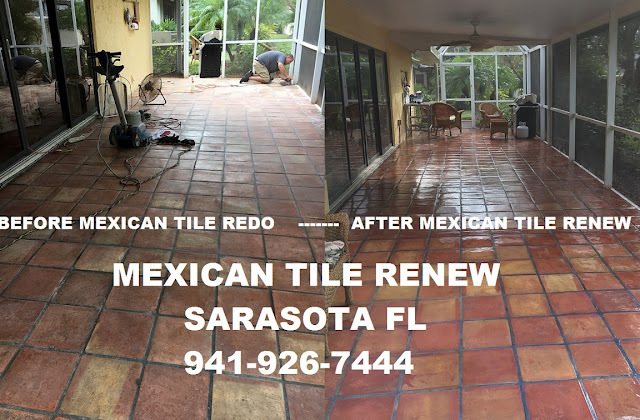 MEXICAN TILE RENEW OUTDOOR PROJECT OF 35 YEAR OLD TILE IN SOUTH SARASOTA COUNTY FL. As Saltillo tiles are fired at such low temperatures, they remain very porous and are therefore very susceptible to water damage. It is almost exclusively recommended these days that you seal Saltillo tiles to protect them from water, wear, and scratches, especially in exterior applications were Efflorescence can form and white spots accumulate. Typically, Saltillo tiles should be sealed after they have been installed and are completely dried and clear of extra dirt and debris and annual upkeep is highly recommended for exterior applications. MEXICAN TILE RENEW OUTDOOR PROJECT OF 35 YEAR OLD TILE IN SOUTH SARASOTA COUNTY FL. Since humidity has a definite effect on whether or not the white salt spots appear on exterior Mexican tile, it can be assumed that efflores­cence is a seasonal problem. The intensity of efflorescence increases after rainy winter seasons, de­creases in spring, and by summer has practically disappeared. 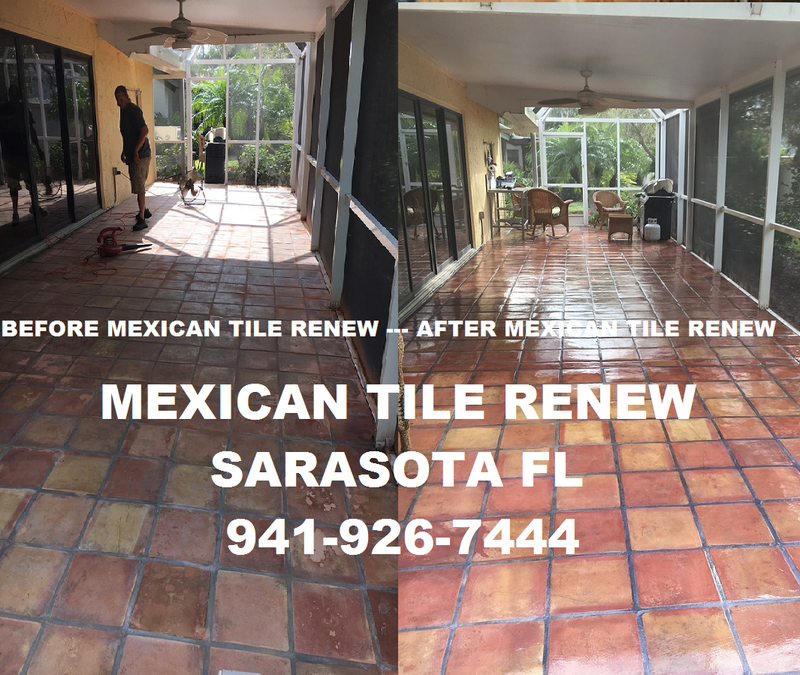 MEXICAN TILE RENEW OUTDOOR PROJECT OF 35 YEAR OLD TILE IN SOUTH SARASOTA COUNTY FL. Efflorescence is a crystalline deposit on surfaces of masonry, exterior Mexican tile, stucco or concrete. It is whitish in appear­ance, and is sometimes referred to as "whiskers". Efflorescence has been a problem for many years, and is a topic of much controversy. The formation of these salt deposits are not mysteries. They are, for the most part, water-soluble salts that come from many possible sources to mar and detract from an other­wise beautiful and serviceable structure. First of all, there must be water present to dissolve and trans­port the salts, remove the source of water and your almost there. Labels: MEXICAN TILE RENEW OUTDOOR PROJECT OF 35 YEAR OLD TILE IN SOUTH SARASOTA COUNTY FL.